"I think the best advice that I've gotten so far is just to sacrifice myself and be willing to give of myself for her and her needs and put her first." 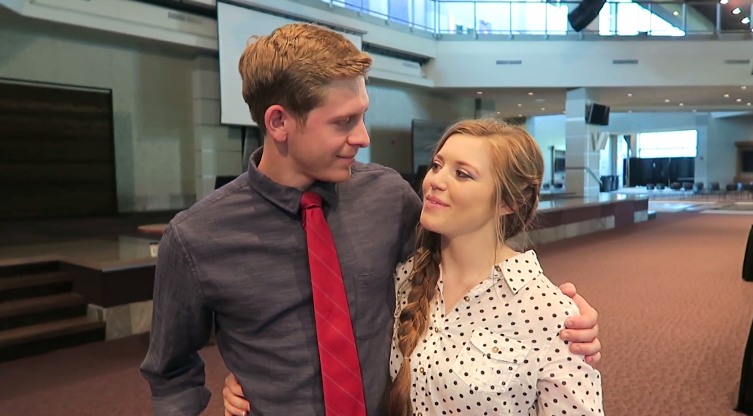 Joy-Anna Duggar's wedding special is only one week away! Next Monday, on the Counting On season premiere on TLC, watch Joy marry childhood friend Austin Forsyth during a rustic-chic wedding ceremony attended by 1,000 guests. Joy and Austin share a message at their wedding rehearsal in the video below. Perfect match! Very mature and heartfelt love and respect for one another. I don't think anyone is mature at 19, certainly not in matters of love. You can't be. You have no perspective on life or experience being an adult. That's just the way it is. You're still a teen. Even your brain is not fully developed by that age. I wasn't mature then, not compared to how I was much later. In all honesty, were any of you mature at 19, when you compare yourselves to who you are now and what you've experienced and accomplished since that age? It really depends! I was 19 and now, 18 years later, we are so happy that we were married young and love our family! a few years and experiencing some independence. You can't make blanket statements that no one is mature at 19 years old. Everyone matures at their own rate. I was 19 when I was married, and we have been happily married for over 25 years. The length of marriage isn't dependent upon what age you get married. It depends on several things including your level of commitment to each other, common faith, morals, and goals. No one should be the same now as they were years ago. We should all continue to grow and learn, but you can do those things with your spouse. Anon 7:14, is there some magic age that everyone reaches maturity? I know some adults who still aren't mature in their forties. Other people are mature as teenagers. I think a lot of it has to do with how you are raised. Some parents don't have their children do chores or take care of any responsibilities. Those people may not be ready to marry at 19 or 20. Doing chores doesn't make you mature! You gain maturity through experiences, some good, some bad, and trying to achieve things by yourself. You need the wisdom to know what to do in different situations and how to react properly. You can only get this through yourself. Having your parents always there to tell you what to do or to diffuse a situation for you does not give you maturity. The Duggar girls are too sheltered in that way. I think doing chores does help to instill a sense of responsibility and also respect for authority. However, so many people nowadays give the parents all the credit when the kids turn out "right" and blame parents when the kids go sideways. But each human has his/her own makeup and free will, and life experiences also play a huge role. I have seen two kids from the same family, raised exactly the same, turn out 180 degrees apart. My point about chores is that if you grow up with your mom making your bed and cleaning up after you, then you haven't learned any responsibility. You aren't ready to get married if you haven't done anything to learn how to even take care of yourself. Is there a way to watch online? will the episode be available somewhere later? I love that quote that you put on there. I like Austin's attitude. I love what he quoted , as well! I totally agree. I wish we could "like" a post instead of saying "I agree." JoyAnna's wedding will be as beautiful and meaningful as she is. I look forward to watching the summer season. I am hoping that Derek doesn't stop matron of honor Jill during the recessional and shove the best man aside. It is a rude and tacky action, started by Josh and added to by Derek, and needs to stop. Not about them! @June 5 2017 at 5:02pm, totally agree with you! But as far as we know Joe did still the spotlight by proposing to his girlfriend even if he had Joy and Austin's approval I still believe it was a very poor taste! Can't wait to watch the wedding though she looked beautiful!!! If Derek did play around and shove aside the best man, it isn't a big deal. The wedding is over at that point. They are leaving. It didn't interrupt any of the wedding service. The bride and groom have left at that point, so it doesn't take away from them at all. I am sure Derek doesn't do it for attention. It is just his little way of making Jill feel special. Cant wait to see. I think joy's wedding will be close to what I would imagine mine would be like. I'm glad he is focused to provide the best for Joy. She is naturally such a giving soul and having a compassionate partner should assure a healthy life together. I'm looking forward to watching it on YouTube since we don't have cable. I agree with the above. We are all so excited to see Joy walk down the aisle with her love and to start married life. I am praying more to NOT have TLC replay the wedding and the whole thing repeatedly like they did with Jinger's. I believe that cost a lot of fans last season and will cost even more if they do it again. Nunya, do you actually pray for that or is that just a figure of speech? Not being nasty just a curious question. Love his attitude towards marriage! That quote(best advice I have seen for a newlywed) should be included in every marriage vow across the country! Marriage does take a lot of work and self sacrifice. But truly, can be so rewarding! You now have someone to share everything with! What a gift from God. Too many people seeking fast love and good times and are so alone. Marriage can be such a treasure!! Since their family seems to actually take care of the children they have, then I say have as many as you want. The people who have one child and don't take care of him or her shouldn't have children. I find it rude when people comment on how many children someone else "needs" or "doesn't need" to have. It's a personal decision and really no one else's business (with the exception of parents who expect someone else to pay for their children's upbringing, in which case the people who they are expecting to fork over the money definitely have the right to say something). Do all the people who complain about the Duggars having children complain so vociferously about those on the welfare rolls having child after child? The Duggars support themselves. What you say that day and how you treat each other later can be two completely different things. I've seen too many couples who beam happily on their wedding day, vowing to stay together til death parts them, yet are at divorce lawyers a few years later. Saying it is one thing...living it quite another. Agree 3:51. I can think of dozens of examples of that in my own experiences of watching weddings take place and then marriages collapse. I always wonder why the words they said and those feelings they had seem to mean nothing later. Remember how Josh sang that promise song to Anna? could they be truthful how could he be her best friend when they do not even let the girls go out alone let even talk to boys without any super vison so I cannot see him being her best friend. does this even make sense? just something to make us think about having this show on the air. Camilla, I'm sorry for your loss of your dad. I pray your mum will get through her loss of her dear husband.